I like to combine lilacs with pinks, purples, whites and splashes of yellow to help calm the mood of a garden. These colours do more than most to send out an invitation to slow down, take a seat or plop down onto the grass. And they are very easy to mix together. The only thing I’d say is to go easy on the yellow but really explore the range of pinks and lilacs available. And don’t forget that this colour palette will draw attention to the range of greens at play so keep an eye on the balance between evergreen and deciduous plants and also between shiny leaves and furry ones! Use striking plants (like the spiky Salvia verticillata in the foreground) by repeating through the garden to draw the eye through – these spiky players help to keep a rhythm going through the border. 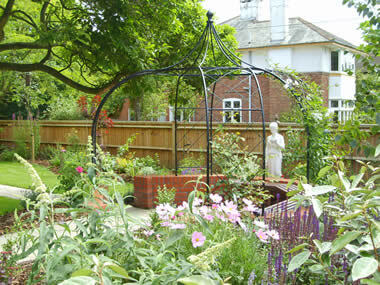 This border is deep and wraps around a beautifully sculptural focal point – a metal gazebo with roses and clematis scrambling up it. This is quite a romantic take on the English cottage garden style and unashamedly rich, voluminous and packed. I planted this border in May and the picture, left, was taken in July (3 months later). Lavender and Rosemary – loads of these!